Check out what our guest's thought about their week long adventure on KO8 Escapes this August! 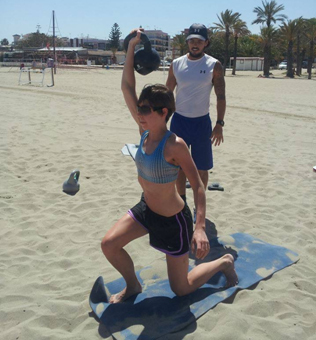 Whilst our new KO8 program launches in our new home of Thailand this July, we have been running successful Bootcamp style escapes in Spain for a number of years. These are our Tribe. Those incredible individuals who have stepped out and stepped up to make a positive difference in their lives and commit to themselves. I was looking for a training experience which was something different and managed to come across KO8 during my research. It stood out to me for being one of the more personal services available. I understood that a lot of people want to loose weight at boot camps but I actually wanted to gain weight if anything. The small number of people on the camp and the promise to tailor my training were the main factors for me giving myself a weeks holiday in Spain with Kieran Owens. I can safely say it was the most effective weeks training I have ever done. I gained 2 lbs of muscle during my stay, which was unbelievable given the amount of cardio we done. Kieran took me down to do extra weight sessions each evening, while the others took a few hours rest. Patsy (the chef and yoga instructor) tailored my meals to ensure I didn't lose weight like the 5 others on the camp. I got bigger meals than the others! The food was fantastic too!!! I have no doubt the camp helped me prepare for my Gaelic football season coming up and I would recommend the camp to everyone who either wants to prepare better for their sport or to get themselves in shape. Wonderful location, wonderful training and wonderful people! 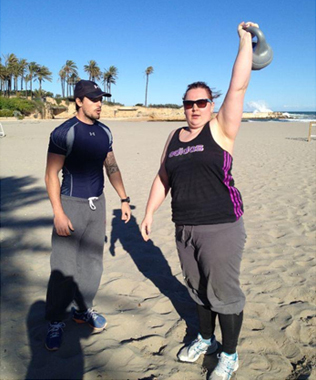 Karen Marshall changes her life with two weeks at KO8 boot camp! "TWO WEEKS? WAS I MAD!!!!?". That's what everyone said at work. Well, no, I wasn’t mad. In fact it was probably the best thing I've ever done and I plan to go back for more, sooner rather than later! From the moment Kieran (our trainer) greeted me at the airport he puts you at ease. I was very unfit and slightly overweight, plus I'm not getting any younger! But KO8 Javea Boot Camp has changed all that (except the "gettin' older" bit!). Firstly, Kieran's such a fantastic trainer. He pushes you hard knowing that this will bring the best out of you, which in turn makes you want to achieve better things. He’s also on hand to answer any questions you may have, no matter how minor. One of the problems I have is with my knees. Kieran would always offer an alternative exercise if my knee(s) were hurting or if he saw me struggling. The positive energy he has rubs off on you and this makes you want to try that much harder. There were times when I thought "NO WAY! ", such as the Steps. I managed them six times the first week and bettered it by two the second week. My fitness was so much better during the second week and I achieved so much more than I would've thought possible; the knowledge you take away with you is priceless. Setting off for circuits down on the beach in the morning was just fantastic with the view of the ocean; you don't get this sort of view back home! Every day was different doing various exercises as well as great walks up the mountains (poor Kieran with all that water in his ruck sack! ), and what fantastic views. I was terrified looking at Mount Mongo, but it was well worth the climb. If I can make it, so can you. Now yoga isn't as easy as some may think, but it's a good way of toning as well as a great way to stretch and chill whilst listening to Ray Lamontagne at the end of it (I'm now a big fan!). Yoga on the beach, learning all the moves, with the waves crashing in the background was breath taking; some nodded off at the end, mentioning no names! Zzzzzzzzzzzz. The food that the lovely Patsy Anne, Kieran's mum (or sister as some would say!) prepared for us all during our stay, helped by Rebecca (Kieran's beautiful girlfriend), was excellent and of restaurant standard; I wanted to take Patsy Anne home with me! Rebecca was great, too. Not only does she take part in the training exercises, Becky also gives you support and encouragement. There were a few times when I thought "HELP! ", but Becky was there shouting "Come on Karen, you can do it!". I should also mention Becky's facials, which I highly recommend. I had two and a manicure. Not only do they make you feel great, your skin feels like new. And they're not just for women, men can have them, too. Big shout to Charlotte. I would never have made that walk during the first week without your support (X). Thanks you guys for all your encouragement on the second week (you know who you are) and Siobhan; what a finish for the girls, flying in the air for the finish line. I'll treasure that moment. Most important, in addition to the great company, I lost 7.7 pounds, plus 6.6 inches, during the first week and remained the same weight in the second week but had an overall loss of 9.9 inches. Lost a further 5 pounds since I've been home and the weight is still coming off. I'll keep you posted on my progress. As for the Burpess, I went from doing 5 in the first week to 15 in the second! If you do nothing else this year do this, KO Beach Boot Camp. Nothing is too much trouble for this great team. I was there two weeks and they treated me like I was part of the family. Thanks guys (X). The villa where I stayed was both comfortable and stylish; pure luxury! Lookin' forward to going back again soon, this time fitter and determined to beat some of my previous targets! Sophia loses 9 lbs in one week! Thank you so much for an amazing week - it really has changed my life! It has been an absolute pleasure to meet you both and get to know you throughout the week. I have enjoyed every minute of it - the challenges, the lovely meals - everything! Thanks once again. Loretta loses 12 lbs in week with her daughter! ''18 months before visiting KO8 Boot Camp I was very very poorly and ended up having three quarters of my right lung removed. I worked hard at getting back to ‘normal’ and could walk the dog 3-4 miles a day and thought I’d probably stay at a similar fitness level for the rest of my life due to my lack of lung capacity, which was never very good even before my op. My sister had previously been to Kieran’s boot camp and she had lost weight and said she felt fit and healthy even 10 months after attending. I wanted some of that so we both booked a week in March 2015. To be truthful, I felt completely overwhelmed for the first 2 days! If we weren’t exercising or eating, I was asleep! The third day is when it all ‘clicked’ - I even got my first ever exercise endorphin kick and when our exercise session ended, I dragged my sister off for a little jog! I can’t lie, I found the week really tough; I would never have pushed myself so hard and I would never have thought myself capable of half of what I achieved without Kieran’s encouragement. The hard work was SO worth it. It proved to me I am FAR more capable than I thought I was and I’m determined not to let all my hard work go to waste now I’m back home. Now I jog/walk with the dog - I feel amazing and inspired! I also lost 6.6lbs 8.75 inches! THANK YOU Kieran. Testimonial from the Welsh wonder Rhian Langford! Sharon 'Sugar' Simpson learns how to KO at Boot Camp! Thank you for making KO8 Boot Camp such a wonderful experience. As you know I found your details online through a random Google search. I didn't know what to expect. I didn't actually have a lot of weight to lose. I really just wanted to get fit again and toned. I was worried about attending the camp on my own and felt very nervous. I was looking for a healthy trip that would include a range of activities such as yoga, hiking, healthy eating, comfortable accommodation and good company - nothing fanatical or weird!! I was thrilled with the results. I feel absolutely great. You and your team are such an inspiration and I'm in the best shape that I have been in a long time. I have completely changed my diet, I've started circuit training, swimming and running. At the weekend I will be attending "Left Hook" boxing gym!! It was a pleasure to meet you all. I really miss you and look forward to returning in the New Year. Trust me when I tell you that KO8 Boot Camp is the BEST!! Sandee Smith loses 9.9 lbs in one week! Testimonial from the super human Danielle Chidlow! “The are no words to describe a week at KO8 Bootcamp other than TRULY AMAZING! As someone who participates in sport/exercise 6 days a week I arrived in Spain already very fit- but i left feeling 100% fitter and stronger; and a 'superhuman-alien' as Kieran named me! !Kieran is an outstanding trainer who knows how to push people to reach their limits; and has the ability to tailor every session to suit people of various abilities. His friendly attitude and passion for the health and fitness of his clients shines through and he enables your to reach standards you never thought possible- without the need for any shouting or force like some bootcamps i have read about. The camp has the perfect mix of exercise/activity with relaxing time- and the villa and local areas is a beautiful place to just chill, recuperate and get a tan!! No holiday would be complete without good local cuisine and Patsy's cooking is not to be missed- providing amazing healthy food everyday with massive amounts of variety. From the moment I arrived I was made to feel welcome and by the end of the week I felt like part of the family; I cant wait to return next year. Testimonial from the Sofi Cironkaite (Heart of a Lioness) 11 lbs lost in one week! Testimonial from the awesome Kate Waller, who we will be seeing later this year. 6.6 lbs lost in one week!